COMFORT INN & SUITES – SOUTHPORT, NC – In this month’s Choice OwnerElite™ Rewards Franchisee spotlight we’d like to recognize Keith Stephens, the owner of the Comfort Inn & Suites in Southport, North Carolina. Keith has created a culture that values partnering with the community to generously provide charity to those in need and he’s empowered his general manager, Melissa Fineman, to help build relationships that will last a lifetime. 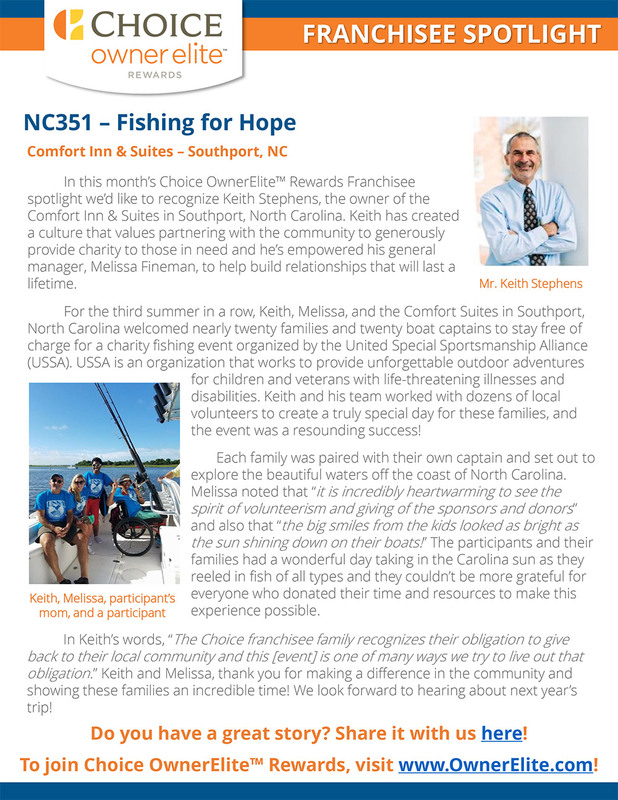 For the third summer in a row, Keith, Melissa, and the Comfort Suites in Southport, North Carolina welcomed nearly twenty families and twenty boat captains to stay free of charge for a charity fishing event organized by the United Special Sportsmanship Alliance (USSA). USSA is an organization that works to provide unforgettable outdoor adventures for children and veterans with life-threatening illnesses and disabilities. Keith and his team worked with dozens of local volunteers to create a truly special day for these families, and the event was a resounding success! Each family was paired with their own captain and set out to explore the beautiful waters off the coast of North Carolina. Melissa noted that “it is incredibly heartwarming to see the spirit of volunteerism and giving of the sponsors and donors” and also that “the big smiles from the kids looked as bright as the sun shining down on their boats!” The participants and their families had a wonderful day taking in the Carolina sun as they reeled in fish of all types and they couldn’t be more grateful for everyone who donated their time and resources to make this experience possible. In Keith’s words, “The Choice franchisee family recognizes their obligation to give back to their local community and this [event] is one of many ways we try to live out that obligation.” Keith and Melissa, thank you for making a difference in the community and showing these families an incredible time! We look forward to hearing about next year’s trip! ← Guests, Inc. selected for Hotel Business’s Top Management Companies 2018 list. Copyright © 2019 Guests, Inc. - All Rights Reserved. Design by Wood & Associates, Inc.